It was a nice warm July evening that turned into a nightmare. One moment of loss of focus, someone else’s mistake and the whole life that we worked to build got ruined. I heard a monstrous bang. After running out on the balcony I looked at the road crossing near the house and I saw elements of the car thrown all over the streets. I only remember that I screamed. I was asking neighbours what make of the car it was, what is the registration number. I didn’t even hear the answers, but I already knew… Horrible and overwhelming feeling paralysed my soul, when I realised this wreck is David’s car, my fiancé’s car. I ran down the stairs screaming and praying to God. I was cursing the reality that I witnessed minutes earlier. What I saw will always remain, the picture I will always see when I close my eyes… I couldn’t even recognise our car. I heard someone mentioned the registration number and I realised that David – the love of my life, is inside the wreck. He’s dying. I barely remember the trip to hospital. I was in complete shock. With my heart in my mouth I waited for any information, whilst the doctors were fighting for David’s life. His Mum was with me, totally paralyzed by the fear of losing her only Son. After a few hours of waiting we heard that our David is in a critical state. We were told that he has cerebral oedema and chances that he’ll survive are 5%. We couldn’t stop to scream and cry. We had just heard that the most important person in our lives could pass away anytime…! Doctors have won over with the biggest danger – cerebral oedema have gone, but then we’ve heard more frightening news. 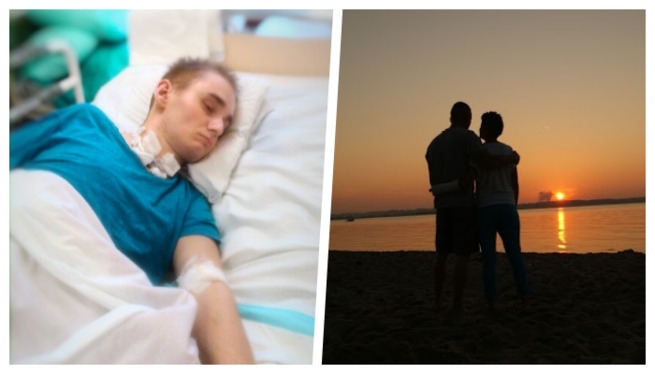 David had suffered brain damage and will likely never wake up again… Hope dies the last! Miracles can happen, David wasn’t meant to live, his chances were close to none, but he survived. He lived regardless doctors prediction that he’ll die. I saw him fight and I had to fight, I just can’t imagine my life without him! It is a tough struggle, life is always throwing new challenges at us, but we can already see positive results of this battle. 2 weeks ago, for the first time in a long time I cried of happiness when, whist I held David’s hand I felt slight squeeze. Although weak and barely perceptible, his touch gave myself and his Mum new hope and strength to fight! Another day and another gift – David reacted to the sound of our song! Every day his interaction is clearer and when he feels my perfumes or hears Mother’s voice he moves his eyelids. 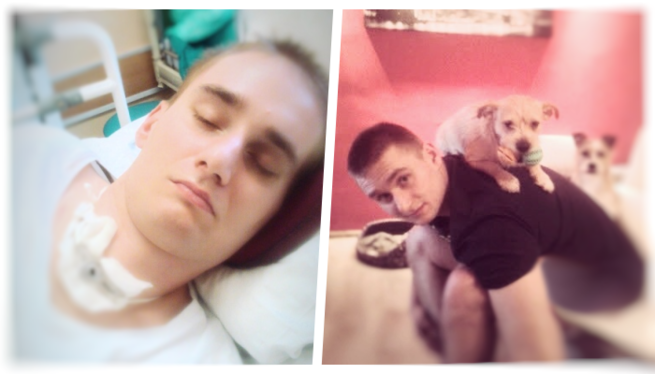 According to specialists from the clinic, current David’s state is called ‘locked-in syndrome’. It’s probably being locked within your own body, like your body was your own prison. It is the state when your body is non responsive, but the person knows what is happening around them. I believe that my David is there inside. He knows that we fight for him with all the power and all the strength we have. He wants to come back, he wants to tell us not to give up on him. Every day I tell him not to worry, because we are going to do everything that is needed for him to come back. It is harder and harder for me to believe in this… In the last month David had a slight fever. We were not allowed for rehabilitation and in this case one day with no exercise is like to go a week backward. Bedsores are almost everywhere, even on his ears. 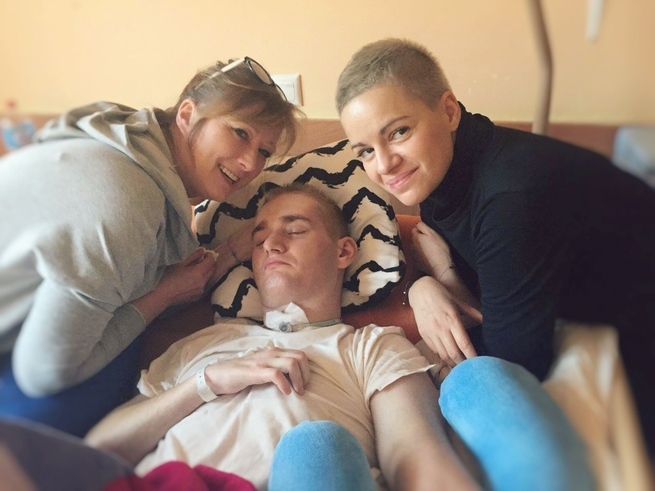 Muscle contractures are so bad, that in a while we won’t be able to straighten his legs… The most important part of healing is the first year after the accident. Any changes that will occur during this period will last forever. Every day we fight, for my fiancé and for his Mother’s Son. It is very hard. We need 24 hours professional medical service. Most importantly we need focused rehabilitation and help from experts. There are only few centres in Poland where we can ask for such help. One of these is a clinic in Krakow and they have already prepared individual rehabilitation and therapy plan for David. This is the only hope for him to come back to life and I believe with all I’ve got, that he will wake up and life will be as amazing as it used to… I need to take him back from the prison of his body and bring him back to life! There is no chance I can do this on my own… Private rehabilitation is costly and not refundable. Solution offered by government is pointless. That is why I’m asking you for help. You are our last hope. I believe that thanks to you David will come back! Love is patient, love is kind. It does not envy, it does not boast, it is not proud. It does not dishonour others, it is not self-seeking, it is not easily angered, it keeps no record of wrongs. Love does not delight in evil but rejoices with the truth. It always protects, always trusts, always hopes, always perseveres, love never fails. We thank you for your love and any, no matter how small gesture of support.